A replacement HUD that can be toggled on/off or placed offscreen so that vital information can still be seen when the in-game HUD is disabled. - Options can be changed using a GUI by double clicking the tray icon or right-clicking and choosing "Settings"
- Hp and stamina bars now change colours depending on statuses like poison, recovery up, bleeding, etc. - "Normal Ammo 1" and "Close-range Coating" now show a stock of "-" instead of "1"
- Section on Palico tools significantly changed, should display correctly when playing as the second member in 2-person parties now, as well as properly hide and show itself to reflect whether your cat is available. - Removed a line causing sharpness bar to show momentarily regardless of weapon type when using the toggle key. 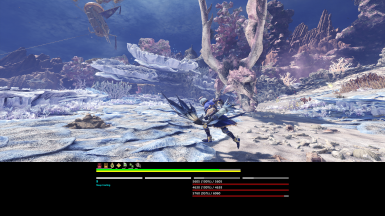 In previous Monster Hunter games, setting the HUD to hidden still allowed vital information to be temporarily displayed by holding down the "camera" or "item selection" button. HUD elements could also be moved onto the second screen on DS titles. This allowed players to avoid having their vision permanently obstructed by floating bars on the edge of the screen when hunting, gathering and generally getting tackled by fish. This time around, hiding the HUD permanently conceals HP, stamina, the minimap, sharpness, the majority of weapon specific parameters and some other things. Hence, this AutoHotkey script was written to act as a toggleable and moveable substitute for most HUD elements. 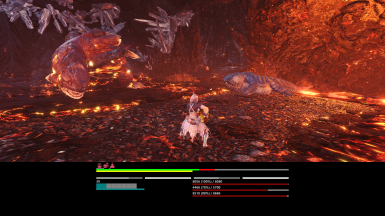 It is not intended to "assist" in hunting - fighting monsters without the original HUD should be done with the expectation of being left, in the best cases, at a marginal disadvantage. However, some features that do expose information not readily visible on the HUD are included because they were convenient to implement. Please be considerate of other players' wishes and intentions. This script doesn't write to memory, but does read values from it. Run the .ahk or the .exe - both should be the same. 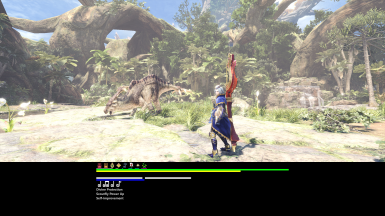 If MHW is running at the same time, it *should* work regardless of which was started first. If the in-game option for "HUD Display" is "Off", turn "Control Guide" in the first tab of the options "On" - this is needed for some values to update properly, the control guide will be hidden anyway. For more info, refer to the readme.